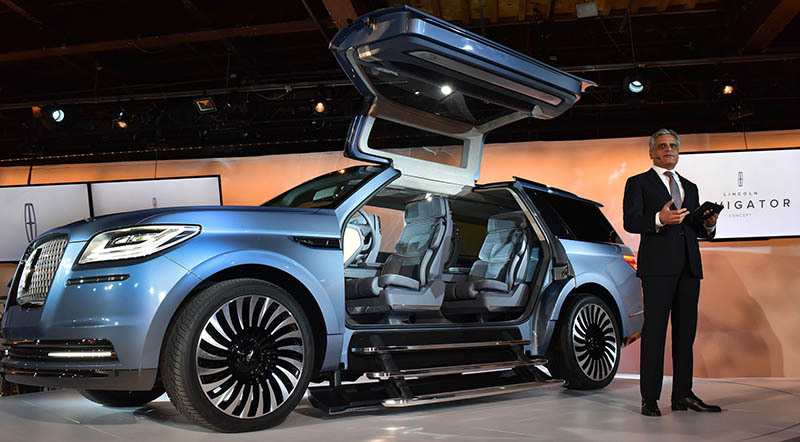 The Lincoln Navigator concept SUV introduced at the 2016 New York Auto Show gave us a hint of full-size SUVs we should expect from the automaker in the future. There are some really amazing enhancements in the new Lincoln Navigator concept which sets it apart from the regular SUVs in the market. For starters, it extends gullwing doors which are similar to what you would see in a Ferrari. Also, a small staircase deploys as the doors open giving a true luxurious feeling. The designers at Lincoln stated that the inspiration for the Lincoln Navigator came from luxury yachts and sailboats. The Strom Blue body paint has been used to resemble the colour of sky and ocean. The interior boasts a spectacular wardrobe management system and a spacious cabin with exclusive Lincoln seats that are 30-way adjustable. The standard safety features will include pre-collision system, pedestrian detection, 360 degree camera, parking assist and lane keep assist. Powered by a 3.5-litre twin-turbo V6 engine, the Lincoln Navigator concept will be able to generate up to 400 horsepower. The luxurious Lincoln Navigator is expected to arrive somewhere in 2018.